Chickens are among the animals that every gardener must deal with in terms of protecting their plants. Some have farms that include the production of dairy products. Others are disrupted by neighbor’s chickens. 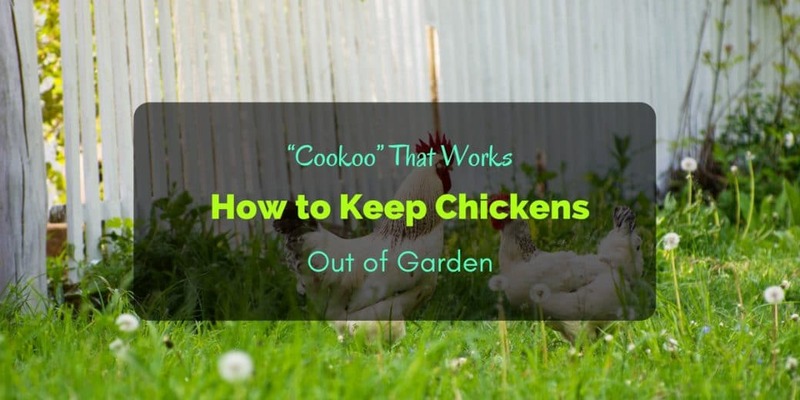 In this article, we’re going to discuss how to keep chickens out of garden in both situations. There are several benefits of having chickens aside from the eggs and poultry meat they provide. They can actually be helpful in the garden. They are a natural eater of certain insects, which include worms, aphids, beetles, even larvae and other common pests that creep in plants. Another thing they like to eat from the garden are seeds of some weeds. And if that’s not enough, their wastes make a great fertilize﻿﻿r. Most garden﻿﻿﻿ers are not excited about the thought or idea of having chickens. They’d rather learn how to keep chickens out of garden than how to take care of them. One major reason is because these animals can greatly damage plants. They tend to step on anywhere and have no boundaries. They also stick their thin, small beaks in the fruits. When surprised, they panic that their wings spread and start running uncontrollably. The obvious way on how to keep chickens out of garden is not to have one at all. Do not get a chicken or two if you don’t want to deal with the problems and damage they may cause to your plants. Problems solved, right? But what if you do need to have a few chickens? Or maybe one of your family members wants to keep some? That’s when you do need some help to take care of this situation. Here are some quick tips regarding how to keep chickens out of garden regardless their presence. First of all, you must determine if there are too many chickens for your yard. Some experts including landscape designers suggest that a small urban yard must only own 3 to 5 chickens, while between 5 and 8 for suburbans. Unless they’re kept in a cage or a hen house (coop), if free-range, chickens are definitely hard to control. It is easy to protect your gardens from chickens if you keep the latter caged. Make a DIY chicken coop to house them. It doesn’t have to be too small so add extra space in which these birds can freely move a little bit and don’t be stressed out. What most gardeners do on how to keep chickens out of garden is placing wires around the plants. This gives them a limit as to where the chickens could go. That is if you let the chickens loose. Otherwise, they will be the ones who have to be surrounded by fences. Regardless, installing chicken wires in the garden is not a difficult task. Wire mesh is also a great choice to build a fence around your plants. This is a much better choice as it is sturdier and easier to cut. If you choose this, place it around the plants and not to house chickens. The use of pebble stones, bricks or cement blocks is also a practical idea on how to keep chickens out of garden. Chickens tend to scratch on soil or plants, but if you place something hard around the plants can help prevent that. Another option that you can install around each plant is staples that are designed exclusively for gardens. This can prevent the chickens from touching, scratching or stepping on your plants. Ensure that each staple is securely set up and doesn’t easily fall down or detach from the soil. One easy solution on how to keep chickens out of garden is to simply separate them from your plants. You can allow the chickens to move freely, run and fly low occasionally if they’re placed in an area away from the garden. Through this list, have you made up your mind on what to do with this matter? Did you determine the best solutions to ensure your plants are safe? What are the most practical measures you think are best for you? The answers to these are up to you so better address the problem and find the right solutions how to keep chickens out of garden suggested above.